Prospects of agreement between the American and Russian presidents on how to end the Syria war dimmed dramatically at the G8 meeting in Northern Ireland. Speaking after their face-to-face talks, Barack Obama and Vladimir Putin said they failed to find common ground on Syria. 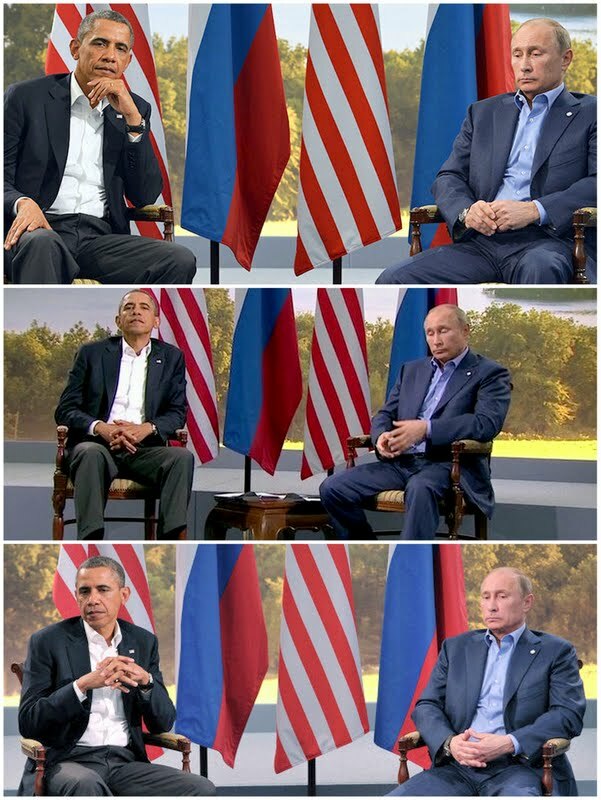 Correspondents say both leaders looked tense as they addressed journalists afterwards, with Putin staring at the floor as he spoke about Syria and Obama only glancing occasionally at the Russian leader. "We also spoke about problem spots on the planet, including Syria. And, of course, our opinions do not coincide, but all of us have the intention to stop the violence in Syria, to stop the growth of victims, and to solve the situation peacefully, including by bringing the parties to the negotiations table in Geneva. We agreed to push the parties to the negotiations table." "With respect to Syria, we do have differing perspectives on the problem, but we share an interest in reducing the violence; securing chemical weapons and ensuring that they're neither used nor are they subject to proliferation; and that we want to try to resolve the issue through political means, if possible. And so we have instructed our teams to continue to work on the potential of a Geneva follow-up to the first meeting." The chilly bilateral meeting between the two leaders ended with a stiff exchange of diplomatic pleasantries. Obama tried to lighten the mood by joking about their favorite sports. He cited Putin's expertise in judo and "my declining skills in basketball." Then he added, "And we both agree that as you get older, it takes more time to recover." Putin cracked a brief smile before adding an awkward admission of the tension: "The president wants to relax me with his statement." In a sign of the tensions, the French president, François Hollande, criticized Russia for sending weapons to Assad's forces and considering deliveries of a sophisticated missile system. "How can we allow that Russia continues to deliver arms to the Assad regime when the opposition receives very few – and is being massacred?" he asked. BBC News posted today two excellent eye-openers on the G8 meeting and Syria. This was a tale of two President Barack Obamas, the one with high dreams and the one who must deal with grubby realities. In the Belfast hall there was some of the old excitement. As the crowd waited for Mr. Obama to appear, the rather staid dignitaries in the upper gallery performed a Mexican wave, to the delight of the school children in the audience. Here, he still has some lingering rock star status. His words were lofty, serious and inspirational. He told the young people that many around the world looked to Northern Ireland as an example of how to make peace. He urged them not to rest there but to break down more walls, heal more wounds. There is a feeling here that peace has become so entrenched, so normal that many are content to accept the gains and not try to improve the two communities. This is the president as the inspirer-in-chief. It reminded me of his speech in Israel. That was a more important moment, but similar in that he was exhorting young people to reach for their better selves over the heads of bickering politicians, using his own background and America's civil rights struggle as an example of what can be achieved. It is where cynics think, "What a president he would make! Oh, hang on, he already is." For this was surely an opportunity missed. He was talking about ending conflict and bringing peace, yet he still has not talked about the biggest conflict in the world today -- Syria. He has made no attempt to explain his shift in policy. That is not to claim there are easy, glib answers, but he's good at complexity and this is a serious issue that needs grown-up debate. He wants to avoid getting embroiled in another Middle East war and to avoid the U.S. dictating outcomes in the region, but he doesn't want Syria to spiral further into chaos or President Bashar al-Assad to continue in power. His meeting with Vladimir Putin will be interesting, because the Russian president knows what he wants and says it. At the moment the U.S. and the UK look irresolute -- talking about increasing help to the rebels without spelling out what they are doing, talking about a diplomatic solution when none is in sight. Russia, on the other hand, appears firm, arguing a no-fly zone would be illegal, and that backing the legitimate government and selling arms to them should be behavior beyond reproach. The president's rhetoric may inspire school children, but it is unlikely to melt Mr. Putin. What we used to call the West finds itself in a pretty strange place when it comes to Syria and Vladimir Putin knows it. Speaking at Downing Street the Russian president was completely unapologetic for arming the Syrian government -- it was quite legal he said -- and looked unimpressed when his host, the prime minister, called President Assad a "murderous dictator". The renewed talk of arming the rebels was meant to put pressure on Putin so that he would, in turn, pressurize the Syrian regime to agree to peace talks. Here's why that strategy may not work. The U.S. president talks of supplying the rebels with arms but shows little sign of wanting to do so whilst the British prime minister sounds positively enthusiastic about sending weapons but cannot persuade his own government, let alone parliament, to do so. There is a stark contrast in the way the U.S. and the UK have talked about this issue. Last week it fell to a relatively lowly U.S. figure to announce America's change of policy. He did it in words so vague and ambiguous that some in the U.S. administration briefed that it might mean a no-fly zone and the supply of anti-aircraft and anti-tank missiles whilst others suggested it meant only small arms and ammunition. We still don't know the answer. We still haven't heard from the president himself. Compare that with the words of David Cameron almost two weeks ago. Speaking to the House of Commons on 3rd June the prime minister condemned "those who argue against ... doing more to support the opposition" as "making some of the same arguments used in the Bosnian conflict 20 years ago." He went on "we were told then, as we are now, that taking action would have bad consequences, but not taking action is a decision too, and in Bosnia it led to the slaughter of up to 200,000 people and did not stop the growth of extremism and radicalization, but increased it. We should be clear, however, about the nature of what is happening in Syria today. It is not just a tragedy for Syria; it could end up being a tragedy for us, too, if we do not handle it properly." For months Cameron has been trying to do to Obama what Tony Blair did to Bill Clinton over Bosnia in the late 90s -- to persuade America that it must intervene and that there can be no hope for peace talks if it doesn't. The prime minister sees Bashar Assad as a modern day equivalent of Slobodan Milosevic -- in other words a dictator who must be shown that "he cannot fight his way to victory or use the talks to buy more time to slaughter (people) in their own homes and on their streets." The irony is that Cameron, unlike Blair, cannot deliver military support himself. That's why the prime minister found himself having to strike a very different tone when he told SKY News: "I think where we can actually give the greatest assistance to the official proper Syrian opposition, is advice, is training and is technical support" - and not weapons. His deputy Nick Clegg made the coalition's position plain when he told the BBC that "we don't believe it (arming the rebels) is the right thing to do at the moment." No wonder the Russian president is not budging. He faces a British prime minister who cannot do what he believes in and an American president who doesn't show much sign of believing in what he's apparently committed to doing.